Boston Philharmonic conductor Benjamin Zander is, among other things, a noted interpreter of composer Gustav Mahler. 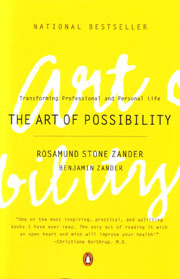 But it’s his book, The Art of Possibility, that has had my attention the past few weeks. Zander and his wife Rosamund have collaborated to produce a manuscript that not only encourages the heart but inspires the soul to help others find their place, their gifts, and their talents in a way that the world doesn’t always let us do. Zander explains that his 30 graduate students at the New England Conservatory are charged, over a two semester course in musical performance, to learn the psychological and emotional factors that stand in the way of great music-making. As great musicians know, musical accuracy and precision are one of the hallmarks of great performances. But, more so, is musical interpretation—connecting with music on an almost spiritual level, finding the deep-seated meanings in the notes and phrases and executing them with passion. Gustav Mahler’s Ninth Symphony is the last completed before his death. It’s one of Mahler’s most musically challenging but also one of the most uplifting as it chronicles the composer’s life of triumph and tragedy. It’s a test of technique, but mostly of interpretation and expression. It’s a little deep, a little dark, but also elevating as it shows how passion makes the best performance—in music, with family, at work, wherever. If you already had an “A” in any subject in life, how would that change your performance? And, if you were to help people get “A’s,” how could it change their lives?